The artist, and by descent. Exhibition catalogue, Circle: Constructive Art in Britain 1934-40, Cambridge, Kettle's Yard, 1982, p. 24, no. 16, illustrated. 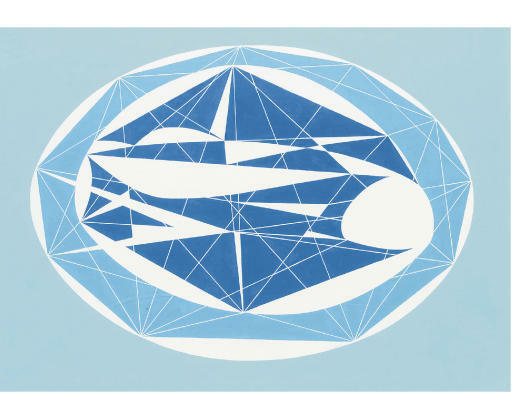 London, Marlborough Fine Art, Art in Britain 1930-40 centred around Axis, Circle, Unit One, March - April 1965, no. 62. Cambridge, Kettle's Yard, Circle: Constructive Art in Britain 1934-40, February - March 1982, no. 16. Arthur Jackson Hepworth was born in Rotherham in 1911, eight years after his cousin Barbara Hepworth was born. Arthur's father and Barbara's father were brothers, so the two were first cousins. Having originally undertaken Medical studies in the footsteps of his father, Frank Arthur Hepworth, a surgeon who practised as a General Practitioner, Jackson dramatically turned his attention to painting. Jackson moved to London to study art under the supervison of Barbara and her husband John Skeaping, who were living at No. 7, The Mall Studios, Parkhill Road, NW3 whilst studying life classes at St Martin's School of Art from 1931-32. Jackson, in private correspondence wrote in 1985, 'It was not long before Skeaping moved out of No. 7 and Ben Nicholson moved in instead ... I soon dropped out of St Martin's School of Art and Ben Nicholson took me on as his pupil. You can imagine what an inspiring tutor he was'. He was elected a member of the 7 & 5 Society in 1934 as what he called 'a promising protegé' and as he wrote in 1985, 'By the time I was just starting to exhibit, in the same shows as Barbara, about 1934, Barbara was already well established. It seemed to our mutual advantage, to avoid inevitable confusion and comparision, not be showing under the same name'. Working in London within the purely abstract idiom of Constructive art, Jackson exhibited at the 7 & 5 society in 1934, the Leicester Galleries in 1935, the Zwemmer Gallery, and published work in associated periodicals such as Axis. He became well acquainted with the avant-garde abstract artists in Europe meeting Jean Hélion and Piet Mondrian in Paris, and Hans Erni in Lucerne at the time of the 1935 exhibition Thèse, Antithèse, Synthèse. In addition, he also encountered émigrés artists from Europe such as Laszlo Moholy-Nagy, the Hungarian former Bauhaus teacher who arrived in London in 1935 and lived near Jackson in Hampstead. The present work dates from the same year as the picture in the collection of the Tate, London, entitled Painting 1937 (fig. 1). In February 1937, Jackson was visited by a young architect and his wife, Leslie and Sadie Martin, from Hull who bought a small painting and were collaborating with Ben and Barbara and Naum Gabo in the production of Circle published later that year. Not long afterwards, he wrote to Martin for advice on how to become an architect; Martin, in his capacity as head of the school of architecture at Hull, offered Jackson a place to study. He began to study architecture later in 1937 until the outbreak of war seeing architecture as a continuation or development of his art. After serving with The Royal Engineers in the Middle East from 1943 to 1946, Jackson worked exclusively as an architect, until his retirement (see lot 42).